This was such a fun wedding! Working with the bride, Mindi, was a treat and all of the special touches made the event top notch. Mindi chose the best of the best for her vendors including Essig Entertainment and Moxie Events. Her groom, Nick, was also very involved with the wedding planning which was sweet that it meant so much to him. The wedding and the reception were held at Smith Oaks Ranch on Lorane Hwy in Eugene. Nick built the ceremony arbor himself and guests were seated on covered straw bales. The reception was in another cleared field area and the rectangular tables were a fresh alternative to the traditional rounds. The burlap table runners were hand-made as well as the burlap “Just Married” banner. We added simple milkglass budvases to each table, wine barrels and buffet tables. The overall look of the centerpieces was cohesive but each table had a different combination of flowers. For Mindi’s bridal bouquet in shades of yellow and white I used “Alexandra” roses, “Butterscotch” roses, freesia, yellow-green cockscomb, hydrangea, stock, “Helga Piaget” garden roses and “Moonstruck” spray roses. Lots of jewels were added for plenty of sparkle. These pictures were taken by Dandelions but if you want to see more of the wedding, check out Erika Nicole who photographed the event. Have you decorated YOUR bra yet? It’s time to start prepping for the launch of Bras for a Cure! A super fun event to dazzle the world with your artistic brassiere expertise! Getting creative for helping those in our community who are undergoing cancer treatment. Decorate a bra (a new bra) in any color, size and way you want. Pick a theme, make it fun, make it statement-worthy. Make it yours. Who says skivvies can’t cure cancer? Or at least help? 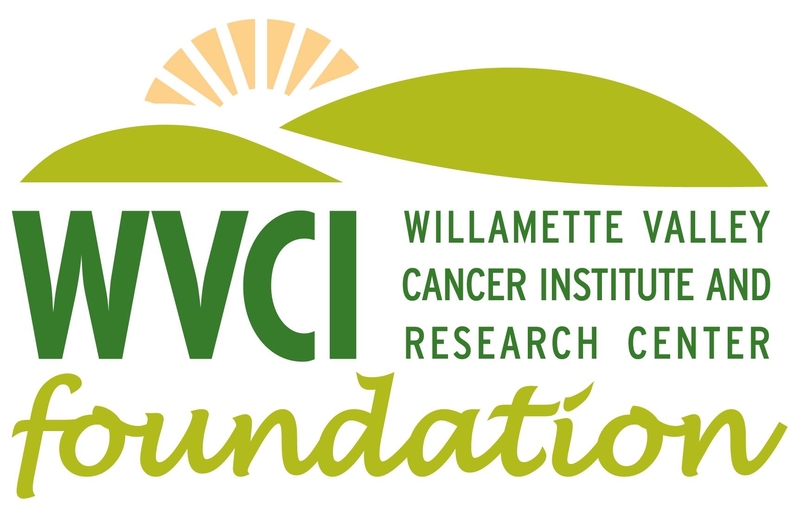 All proceeds from Bras for a Cure go to the Willamette Valley Cancer Institute Foundation, a local philanthropic organization that focuses on improving the quality of life of cancer patients during and after treatment by providing charitable support to Willamette Valley Cancer Institute and Research Center programs. You can do your creative crafting on your own, or form a team of folks from work, your book club, your sorority alumni chapter, or co-workers. The Bras for a Cure competition is open to individuals, groups, organizations – no limit to how many people who can be involved in creating a bra! AND… get your friends together to attend the Reveal Party October 23rd 5:00-7:00 pm at Dandelions Flowers. Enjoy wine and cheese at this free event to laugh, giggle, and enjoy viewing the entries and placing your $1 vote for your favorite! Still don’t get it? Check out some ideas here from similar contest around the nation and GET INSPIRED!! One of our sweet sales clerks, Sophie, got married to her beau, Todd, this August and the flowers were a perfect reflection of Sophie’s sweet, bubbly personality. They were married at a local church and then the reception was held at Sophie’s parent’s rural country home. Since Sophie is definitely a girlie-girl there were lots of pink touches and plenty of tulle! Wedding consultant, Julianne, worked with Sophie to turn her fantasy wedding into reality. We ordered in a variety of rose that is actually called “Sophie”… HOW PERFECT! She also used nerine lilies, hydrangea, roses, freesia, cymbidium orchid blossoms and green “Athos” poms. The bridal bouquet was made even more stunning by adding bead details to loops of lily grass. This was reflected in the groom’s boutonniere as well. Sophie did the reception centerpieces herself using birch branches, the green poms and lighted branches that really showed up once the sun went down. We are so happy for Sophie and Todd and were glad to help one of our own make her dream day come true! We received twice as many nominations as last year making the selection process for this year’s winner even MORE difficult. There are so many wonderful stories about the grandparents in the Eugene/Springfield community that we wish we could award them all! Each grandparent that was nominated does receive a copy of the nomination as well as a gift certificate to Dandelions because we believe they are all special and deserving of recognition. 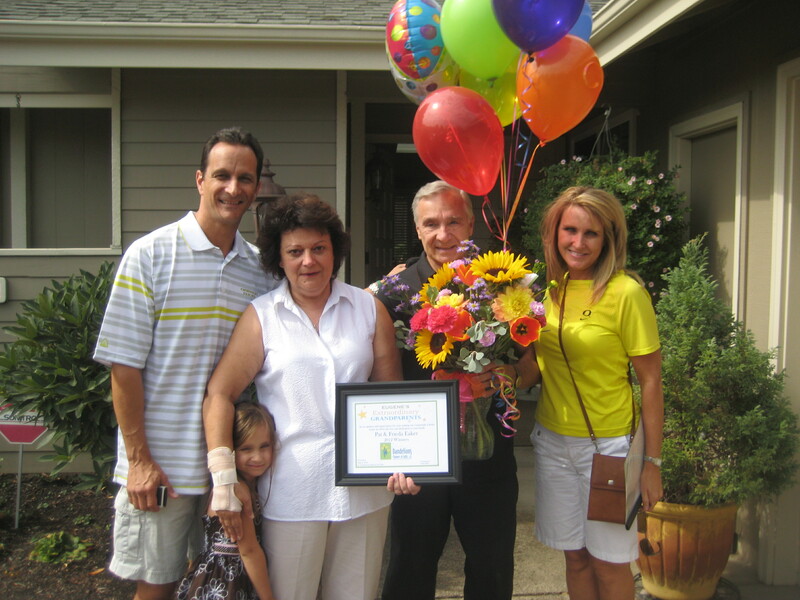 This year’s winners, however, were Pat and Frieda Eaker of Eugene who were nominated by their daughter-in-law Trisha. They were so surprised when we arrived at their door and family and neighbors looked on as they received their honor. Congratulations to such a wonderful couple and the 2012 Eugene’s Extraordinary Grandparents!! – holiday events: always decorating the house, making cookies, gingerbread houses, decorating and hiding eggs, special ornaments for the tree.